Here are the results from all the events during the 2015 @AnteUpMagazine World Championships Series. He started the final table as the short stack with just 261,000 chips. A double-up early on, then he knocks out both Cary Marshall and Jordan Beers on one hand when his QQ holds against A7 and AJ. One the final hand he hits trip 6's against two pair and top kicker against defending champ Justo Avalos for the win. Williams collects $78,860 as the champion. Defending champion Just Avalos lost a big pot QJ v AJ on a J-high board to Cy Williams, then on a 4662x board, he calls Williams' all in with A4, only to see Williams with A6. Cary Marshall is all in with A7, Jordan Beers all in with AJ and Cy Williams, how started the day as the shortstack, has both players covered and is holding QQ. Neither Beers nor Marshall improves and Williams scores a double KO. Duy Ho moved all in with A6 and was called by the QQ of Cy Williams. Duy flopped a gutshot straight draw, but no 3 or A showed on the turn or river, and Ho is eliminated in 6th place, earning $15,820. Justo @AvalosJust Avalos, chipleader going into play tonight with 2,685,000 chips, is the defending champion in this event. He won last year when the final table was held poolside here at Thunder Valley Resort. Married with three children, Avalos has been playing for about 4 years now, and his wife and family have not decided what they'll do if he wins back-to-back titles. Duy Ho, a poker pro out of Honolulu, HI, starts tonight 2nd in chips with 1,558,000. Married with 3 children, Ho has been playing poker for 5 years. He final tabled the 2012 WSOP Event 54, finishing 5th, and took 6th in Event 9 of the 2031 WSOP, along with being the 2013 Macau 6-max champ. If he wins tonight, Duy's wife gets a new Mercedes Benz. Jordan Beers, a poker dealer for BlueDog, starts tonight 3rd in chips with 1,060,000. The Martinez, CA resident has been playing poker for about 10 years and is engaged to Stacie Tomita. He normally plays at the Oaks Card Club in Emeryville, and plays to play more poker if he takes down the title tonight. Cary @Moe_Rawn Marshall has been playing poker so long, he can't remember when he started. He starts play tonight 4th in chips with 805,000. Previous winner of the WSOP Circuit Main Event in Lake Tahoe, Marshall also finished 71st in the 2013 WSOP Main Event and "won too many seniors events to count." Marshall plays to play more poker if he wins, and says what he does best at a poker table is "looking good walking away." @phongturbo Phong 'Turbo' Nguyen, a poker pro from Los Angeles, starts tonight 5th in chips with 478,000. He has been playing for eight years and say his top accomplishment was marrying Lynda Tran. The couple has two children - JadeLynn and Teresa - and don't forget Lucky and Max, the two family dogs. Turbo says he plans to do some charity work if he wins tonight. "Turbo RunGood in life and in poker." a WSOP $1500 in 2013. He says he plays to buy a new car if he wins tonight. Here are the players vying tonight for the 2015 @AnteUpMagazine World Championship title and the $78,860 that goes to the winner. The final table is being LiveStreamed right here via this blog, watch it here starting at 6:30pm. Here are the Results for Event 20 - $100 with $25 Bounties - in the 2015 Ante Up World Championships Series. Here is the LiveStream Final Table for Monday, the @AnteUpMagazine World Championships Main Event. Gabriel Lopez bets out 225,000 on the turn with the board reading 6♦7♥6♣A♠ and Duy Ho makes the call. Ho checks dark - as he has done a number of times in the last 2 hours - and Lopez checks behind. We are 7-handed, one away from the end of the night, with the final 6 coming back at 630pm Monday for a LiveStream final table from the outdoor patio at High Steaks Steakhouse. Defending champion Justo Avalos is more than a million chips clear of the field as he goes for back-to-back titles. Gary Pisarek is all in for his tournament life and chipleader Justo @AvalosJust Avalos makes the call. The board runs out K♠7♠5♣T♣8♠ and Pisarek is out in 8th place, and we are on the Final LiveStream Table bubble. Yanki Koppel moves all in for 171,000 from early position and Cary Marshall hesitates, then makes the call from the BB, having about 700,000 behind. The 9 remaining players are now at blinds of 12000/24000 with 4000 antes. Gabriel Lopez just led out for 75,000, only to have Duy Ho yell out "All in," from the BB. 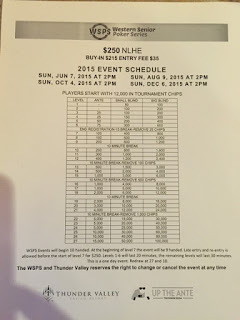 Here are the Results for Event 19 - $250 Western Senior Poker Series. Hieu Le and Cary Marshall are all in preflop, and Marshall has Le covered. You're not seeing hand updates because there are very few hands playing out right now. An occasional all in preflop from a shortstack gets insta-folds all around. A hand that gets a flop is rarely making it to the turn, and the stacks are not changing a whole lot. This 10-handed table is shifting chips around, but nobody is making a big play for anyone else's stack. Justo Avalos being 1.1 million clear of the field may have something to so with keeping everyone else in check. Here are the chipcounts for the 10 remaining players in the Ante Up World Championship Main Event. Justo @AvalosJust Avalos, Defending Champion in this event, leads out for 40,000 and Hieu Le calls. The flop comes 3♦7♥9♥ and Avalos makes it 75,000, with Le making the call. Avalos bumps it to 100,000 more on the 4♠ turn, only to see Le 3-bet to 260,000. Avalos makes the call and we have one of the largest pots of the tourney going. The river is 5♦ and Avalos checks. Le makes it 355,000 and Avalos snap-calls. Le hesitates and Avalos turns over 55 for a rivered set. Le tosses his head back in anguish and mucks. Here are the final 10 players in the 2015 @AnteUpMagazine WOrld Championships Main Event, in seat position order. Duy Ho leads out and Tony Bracy makes the call. The flop comes K-K-J and both players check. A 5 lands on the turn, and Ho bets out, with Bracy making the call. Another 5 comes on the river and the players get it all in. We're redrawing for the final 10 right now. We lost Ian Bey on one hand, Richard Orchid the next hand, and now we have Gabriel Lopez all in for his tournament life and Tony Bracy makes the call. Cary @Moe_Rawn Marshall leads out for 40,000 and Justo @AvalosJust Avalos makes the call from the BB. The flop is A♣4♣6♥ and Avalos check-calls a 50,000 bet from Marshall. The 9♠ hits and both players check. Both also check the 3♣ and Avalos shows 7♠6♣ for 3rd pair. Marshall shows T♦T♥ and takes the pot. Duy Ho catches his straight on the river, AQ on a 9TJJK board, to double through the 55 of Yanki Koppel. The board is 9♦T♣4♦ and Richard Orchid moves all in for his last 86,000. Gary Pisarek calls fast and Cary Marshall is debating a call. Pisarek is flipping a chip in his fingers, looking very anxious and happy, to the point Marshall decides his TJ is not good enough to call. All the Tens are out, and Marshall made a good laydown. Cary Marshall opens for 31,000 and Ante Up Nor Cal Classic Champ @Michael_Loncar moves all in for his last 86,00, with Marshall making the call. Loncar's hand does not improve and he is eliminated in 15th place for $4,726. Sok Chean moves all in, Richard Orchid hesitates, then gets out of the way and @AvalosJust Justo Avalos makes the call. The board goes J-2-8-8-J, Chean is eliminated, and Orchid says he folded quads as he dumped JJ to the all-in. Here are the official chipcounts for the 16 remaining players in the Ante Up World Championships Main Event. Players return to blinds of 6000/12000 with a 2000 Ante. Cary Marshall just doubled Jordan Beers, and now he's in deep in a hand with defending champion @AvalosJust Justo Avalos. The board is J♠A♦8♦J♦ and Cary calls Justo's turn bet, leaving him just 75,000 behind. When the 9♥ hits the turn, Justo calls for the All-in button, having Cary covered. Marshall, releases, leaving himself 7.5BB. 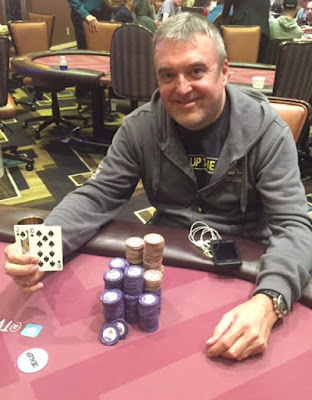 Jordan Beers' QQ doubles through Cary Marshall. The green 25,000 chips have been introduced into play. 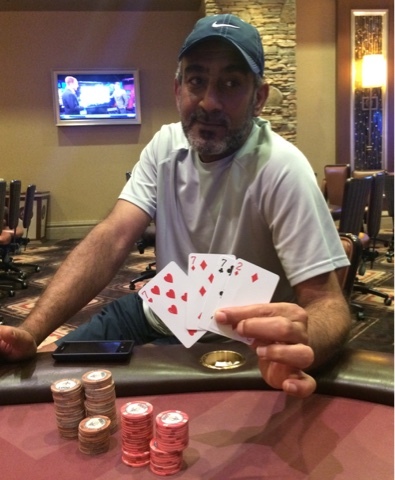 Jeff Wakamiya and Gary Pisarek each have four, while Ian Bey has a full stack of 'em. Cy Williams opens for 22,000, George Saca moves all in, Gabriel Lopez goes over the top all in and Williams calls all in. 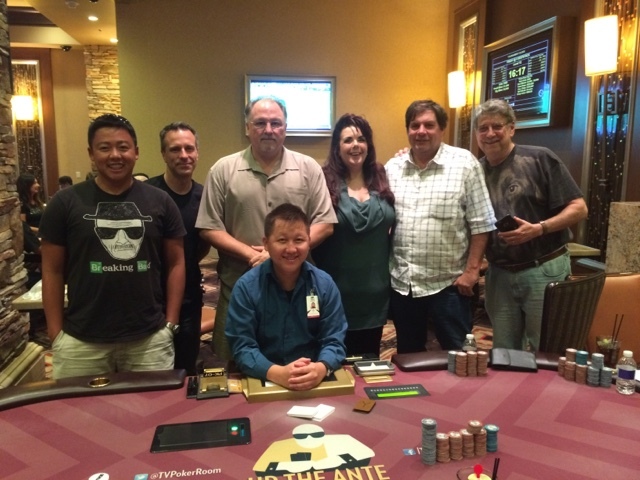 Down to 18 players, two tables, in the @AnteUpMagazine World CHampionships Main Event. Here are the final 18 with seat assignments and chipcounts. Down to 18, full redraw coming, we'll have seat assignments and chipcounts coming shortly. With the elimination of @HeatherReeseAQ in 21st place, we are down to 20 in the @AnteUpMagazine World Championships Main Event. The next two players out cash for $3,519, the same as Reese earned for 21st. Aaron @CaliGrown916 Iqbal and Turbo Nguyen mix it up and get it all in of a Kxx, 2 diamond flop. Nguyen gets there on the turn with a diamond for nut flush in the biggest pot of the night, eliminating Iqbal in 23rd place. Jeff Wakamiya opens for 20,000 from UTG, and Sok Chean bumps it to 60,000 from the button. Wakamiya hesitates, tehn decides to give it up. Chean shows AK and Wakamiya says it would have been a flip, indicating he had a (most likely 66, 77 or 88) pair. The flop is 8♠3♥T♦ and Tony Bracy bets out 45,000, only to see Turbo Nguyen shove, and Bracy calls. Dave Plaskett moves all in from the BB only to see that he ran into the AA of Ian Bey, who raised from the cutoff, forcing a fold from Duy Ho on the button. Come out tonight at 7pm for the final event in the 2015 @AnteUpMagazine World Championships Series, a $100 buyin with $25 bounties. Here are the final three tables, everyone in the money, in the Ante Up World Championships Main Event. In with 77 against 55, Thomas Tran bubbles the Main Event when the other players four-flushes as the K♦ hits the river. Sasha Sabbaghian and @Michael_Loncar mix it up in some blind on blind matchup, with Sasha shoving preflop for 101,000 and Michael going DEEP into the tank. Loncar eventually calls, showing A7 and Sasha showing KQ. There's a 7 in the window, all low from there out and Sasha is out in 29th, sending us to the money bubble and hand-for-hand play. 29 remain here with 45 minutes left in Level 18, blinds of 3000/6000 with 1000 antes. 27 make the money so we are one away from being one away from the money and going to hand-for-hand play. Ben Barad went DEEP into the tank when Thomas Tran shoved the river on a 2-6-Q-6-Q board, taking so much time that Tony Bracy - not in the hand - threatened to call clock. "I've never called clock on a player when I wan not in the hand but I am about to do so now," said Bracy, adding more than three minutes had already gone off the clock. Barad eventually folded, Tran taking down the pot to move to 130,000 and Barad to 105k. Barad shoved the very next hand with AK and was called by another player's AQ. His hand held and Barad is back to 225,000. Justo Avalos - who won the 2014 @AnteUpMagazine World Championships Main Event - said earlier this week he was ready to make a run at defending his title. He played a number of the preliminary events, but decided to sit out the $365 heads-up tournament to better rest and prepare for the main event. He fired once and ran rough, decided to buy back in and has been on a tear ever since getting his second 30,000-chip stack. Today in Level 17 he moved into the top-5 in chips with more than 400,000. 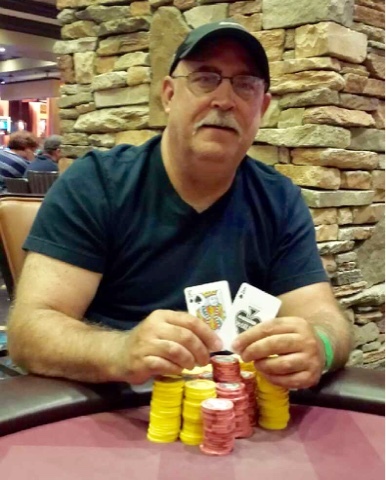 He said his goal is very simple, to have the winner's chips placed in a water-tight bag so he can dive into the pool at Thunder Valley to collect his back-to-back titles winnings. Ian Bey opens for 11,000, Yanki Koppel calls and Bau Liu moves all in for more than 100,000. Bey folds and Koppel calls. Liu shouts "Yes!" as an A is in teh window on an A6K flop. The turn is a 7, however, Koppel catches a set and Liu is eliminated when a 4 lands on the river. Seven different players are vying for the chiplead at the moment here halfway through Level 17, blinds of 2500/5000 and 32 players left, just 5 from the money. 33 remain, 27 cash, 6 from the money and 6 from a full 3-table redraw. Remember, we play down to 6 today, with the final table coming back at 630pm Monday for a LiveStream from the outdoor patio at High Steaks Steakhouse. Early in Level 17, blinds of @AllenKessler-approved 2500/5000 and Michael Loncar goes over-the-top of Tony Yuke, all in for 86,000, James Hays repops all in for 140,000 and Yuke gets out of the way. The AK holds on an 8-high board. Jeff Wakamiya bets out 75,000 on the river, Duy Ho calls, Wakamiya shows 44 for a full house and moves to 540,000, Ho down to 285,000 and we have a new Ante Up World Championships Main Event chipleader. Wakamiya started today with 174,500 and went on a heater for all of the last level. Michael Loncar raises to 11,000 UTG, chipleader Duy Ho calls, Jeff Wakamiya makes it 45,000 and Bruce Angeski undershoves. Loncar tank-folds and HO gets out of the way. Carolyn Bermudez missed the entire first two levels today, showing for what she thought was the actual starting time of 2pm. 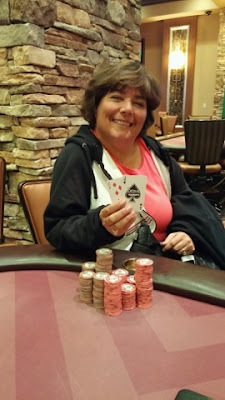 He lost half of her stack to blinds and antes, but sits with 60,000 chips and only 10 players out of the money as she arrives for the start of Level 17, blinds of Allen Kessler-approved 2500/5000 and 500 antes. The 37 remaining players are on a 10-minute break, and the LiveUpdates team is running to Peets for coffee. 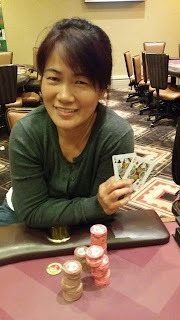 Jeff Wakamiya leads out for 11,500, called by Ante Up Nor Cal Champ Michael Loncar, then Ante Up 101 Casino Champ Tona Katkuoy moves all-in and we have 3 to a flop. Brett Murray was down to a single yellow 1,000 chip, facing an all in for half the SB, both Ian Bey and Thomas Tran also in the hand. Bey raises to 11,000, Tran calls. Bey bets out on the A♠Q♣3♥ flop and Tran folds. Duy Ho is the first player to cross the 500,000-chip barrier. Approaching the first break of the day, players at blinds of 2000/4000 and Ho is sitting at 520,000. Here are some of the players in Day 2 of the Ante Up World Championships Main Event. 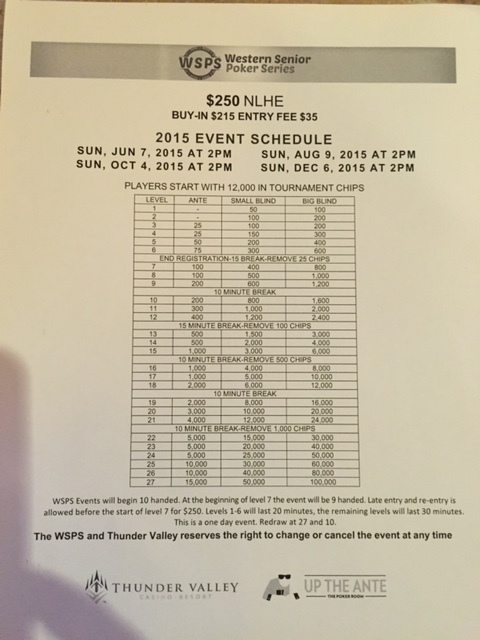 The Western Senior Poker Series returns to Thunder Valley today at 2pm for the second of its four-part series. The $250 buyin features 12,000 chips and 20-minute levels for the first 6 levels, with 30-minute levels from level 7 to the end. We have a no-show 90 minutes in to Day 2. Carolyn Bermudez started the day with 122,500 chips, and her stack is being blinded off as she has yet to take her seat for Day 2. Kathryn Tran moves all in and is called by Heather Reese. Aces Not Good, or are They? The flop is K♣K♠8♦ and Gabriel Lopez bets 35,000, only to see Thomas Tran minraise him to 70,000. Lopez tank-folds and shows AA face up. Tran says "Want me to show?" Lopez says yes and Tran shows QQ. First hand of the day and Duy Ho and Shawn @Sac_Poker Roberts mix it up in what turns out to be a huge pot, and since it happened a while ago, we already know from Ho that he was holding QQ. The flop came out KQ9, giving Ho a set, but there was a flush draw on the board as well, so he bet out and Roberts called. A 2 on the turn and HO bet again, Roberts calling fast. Roberts, who started with 189,000, lost almost all his chips and was out shortly thereafter. Ho is now up to almost 400,000 and has today's chiplead. Gerald Silva moves all in and Dave Plaskett calls. Tony Bracy started the day as chipleader, more than 100,000 clear of the field. He's bled chips off to Brett Murray and others, doen to under 300,000. He's in the BB and is the only caller to the 29,000 all-in from Chris Penfield. The board runs out 9dTsJh5d9s and Penfield is eliminated. One hour in the books and we're down to 43 players, 27 make the money. A WPT final table clash over at one of the outer tables as Ubaid Habib moves all in for his last 24,000 and is called by Joe Nguyen. Brent Lickiss opens for 15,000 and Bruce Angeski calls. Both players check the Jc-8s-3d flop, and when the 8d hits the turn, Angrski moves all on, only to be snap-called by the short-stacked Lickiss. Barry Greenstein - Ace In The River - eliminates Lickiss. Cherie Wallace is all on for her last 14,000, called by Kathryn Tran, but Jordan Beers makes it 30,000 more. Tran struggles but funally releases 8c8s face up. The flop is all spades, a Qs for fourth spade to give Wallace top pair - andTran her flush if she stayed in, bit the T on river goves Beers his set, eliminating Wallace. On a Q-high board with 2 diamonds, David Lucchesi is all in for about 75,000 and Cherie Wallace calls for most of her stack. a 5d hits the river and Lucchesi doubles. Shawn @sac_poker Roberts started the day with 198,000 in chips but before we could even get to his table, his chips were in front of another player and Roberts is out in 52st place. Mario Sequeira ran well earlier this year in a number of WPT DeepStacks events at Turlock Poker Room. Starting today as second shortstack, however, and he is out after just a few hands. Here we go for Day 2 of the @AnteUpMagazine World Championships Main Event. Tournament Director Matt Savage has the players in their seats and cards are in the air. 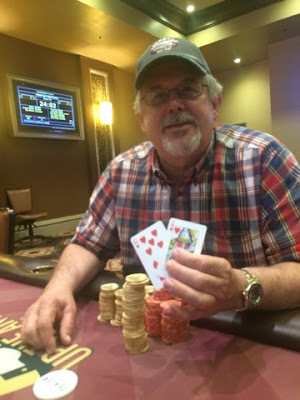 Tony Bracy - 2 final tables in WSOP-Circuit events in Lake Tahoe last year (one event won by TVPokerRoom regular Donna Delfin, and the other a runner-up finish for Jeff Day) Has had the chiplead from early on Day 1. Follow all the action here as we first play down to the money - 27 players - then to the final 6 who return 630pm Monday for the LiveStream Final Table. Here are the seat assignments for the 52 players returning for Day 2 of the @AnteUpMagazine World Championships Main Event.